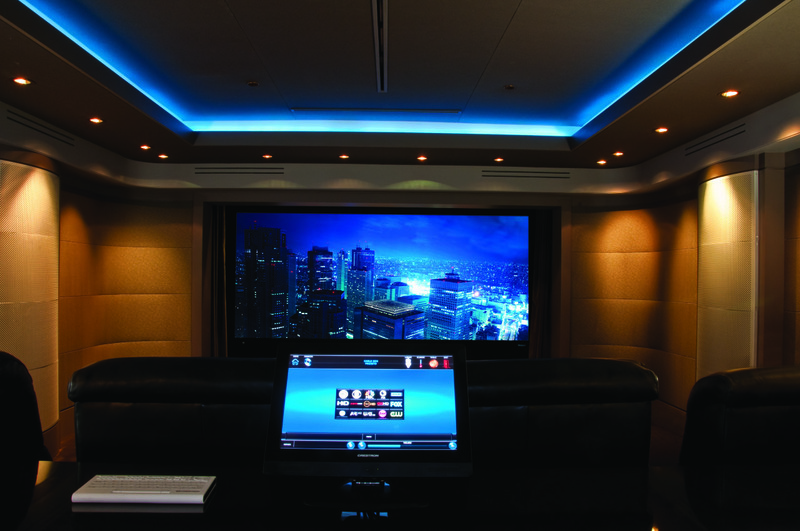 Custom Controls Creates A Perfect Home Cinema In Dubai! Custom Controls always had a thing for aesthetics and room treatments, and with this home cinema Dubai, they have created a setup that’s utterly functional at best. The width of the room reduces slightly around the end, which help in getting better sound experience. LED step lighting add to the flooring needs, while the star effect on the ceiling is extremely pleasing and doesn’t hinder the movie viewing time. With Cineak Vedette chairs and Onyx tables, this is the perfect luxury movie watching at home. For achieving the right level of automation, the project relies on the Crestron TPS-6X wireless remote control, which allows the client to have complete and quick control on all elements, including lighting to air conditioning. The system also boasts of getting a Blu-Ray and DVD film library, which is available on a Kaleidescape Server system and gets feeds from Satellite TV and Apple TV. There’s also a setup for the gaming consoles to enjoy gaming right on the big screen. There’s also the Crestron wall plate to get an additional source, if need be. It’s easy to understand why this is a special project for Custom Controls! How do roofs affect resale value? Should Homeowners Be Concerned About UV Protection in Their Replacement Windows?